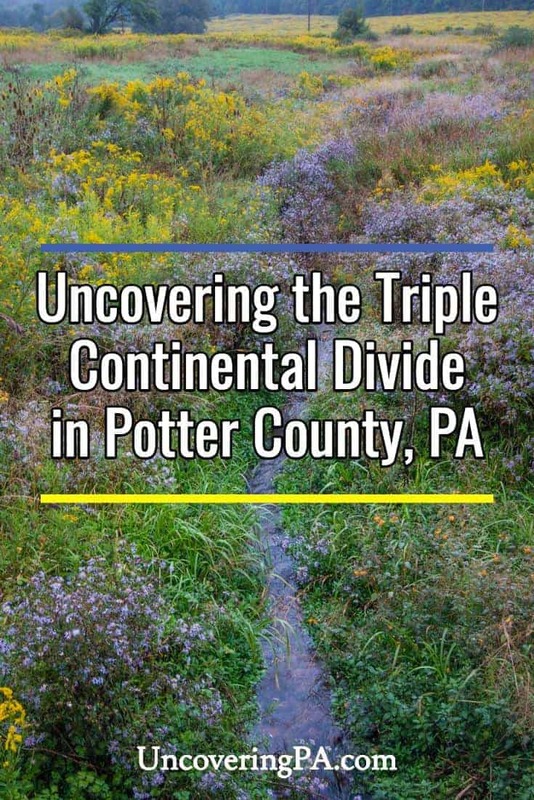 Pennsylvania features many amazing sites, but few are as geologically significant as the Triple Continental Divide in Potter County. 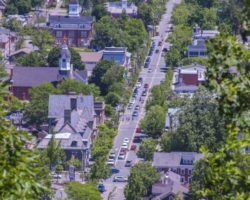 Located near Gold, PA, north of Route 6, this area is the start of three major waterways: the Allegheny River, the Genesee River, and Pine Creek. According to signage that appears near the divide, this is the only Triple Continental Divide in the country east of the Mississippi River. I recently took the time to track down each waterway to its uppermost publicly-accessible spot. These were all road crossings, and while it would be great to go even further upstream, doing so would require crossing private land. This sign is located near the only Triple Continental Divide east of the Mississippi River. The sign denoting the Triple Continental Divide is located at the intersection of Route 449 and Rooks Road. This sign offers a bit of information on why this area is special and about the three major waterways that start near here. While not located directly on the continental divide, it’s in close proximity to it. When rain falls in this area, as it was when I visited, the water will flow from this spot into the Gulf of Mexico, the Chesapeake Bay, and the Great Lakes. The Triple Continental Divide sign can be found at the following coordinates: 41.858988, -77.825243. There is a bit of space to pull off on the southbound side of the road. The source of the Allegheny River is located in a beautiful field. 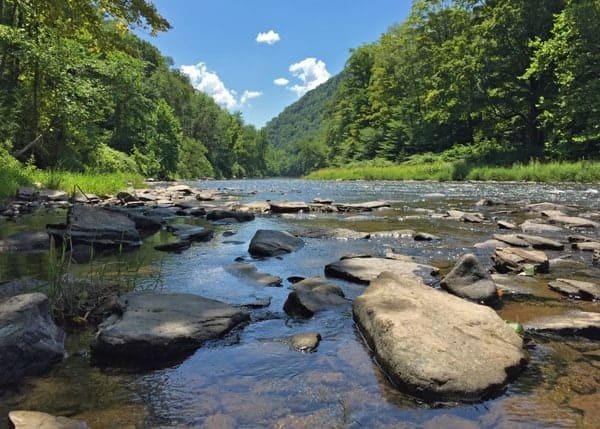 The Allegheny River is one of the most well-known waterways in Pennsylvania and flows from this spot in Potter County to Pittsburgh before joining the Ohio River. In fact, the Allegheny River is the largest source of the Ohio River, which is, in turn, the largest source of the Mississippi. 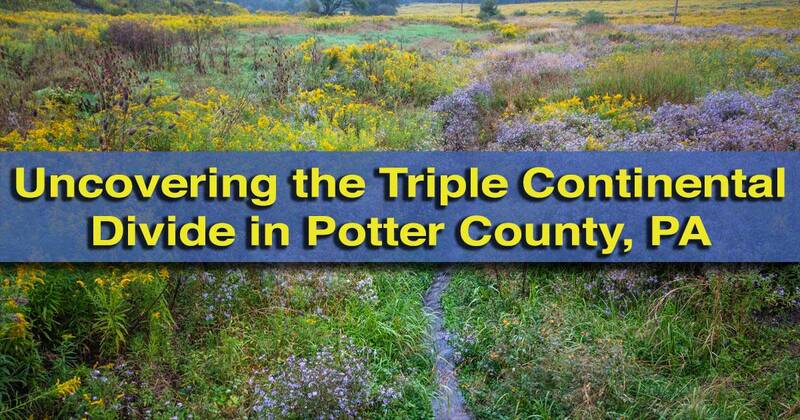 The source of the Allegheny River is located 3.5 miles from the triple divide sign along Route 49. The river is so small here that I was able to easily step across it, so, don’t be expecting a major river crossing. However, there is both a historical marker and a river marker denoting the spot. The Allegheny River passes through downtown Pittsburgh just before flowing into the Ohio River. 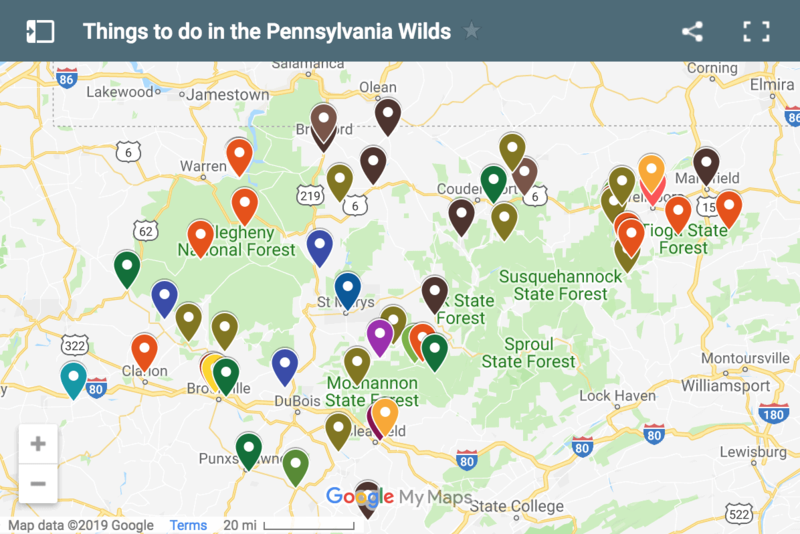 During my visit in early September, the field through which the Allegheny River was flowing was filled with fantastic wild flowers and was one of the most beautiful fields I have ever seen. 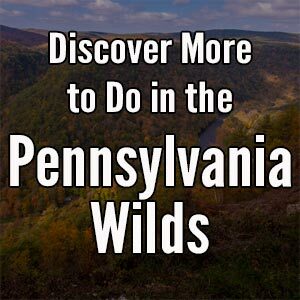 The source of the Allegheny River can be found at the following coordinates: 41.854648, -77.876235. If you opt to pull over here for a closer look, use extreme caution as it is along a busy road and the shoulder is not very wide. 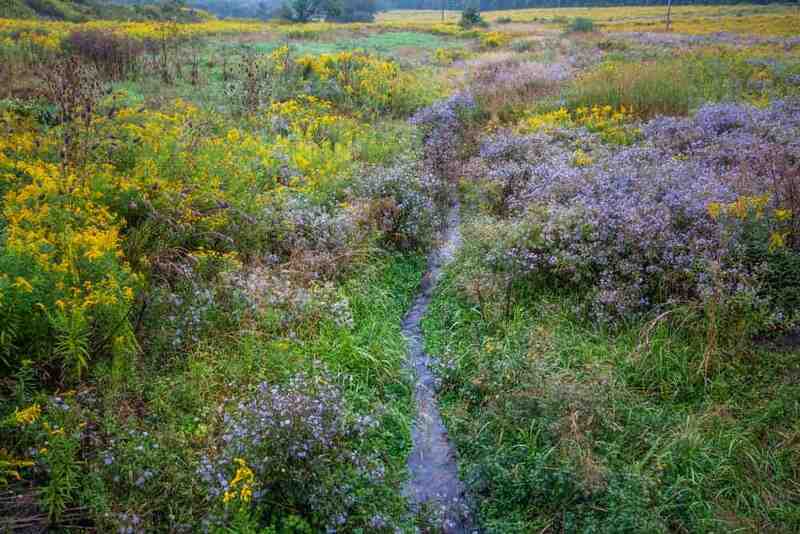 The source of the Genesee River is barely visible as it makes its way towards the Great Lakes. The Genesee River is the second waterway with its source at the Triple Continental Divide in Potter County. This river is only in Pennsylvania for a short distance before crossing the border into New York. However, in New York, it’s a river of incredible beauty and importance. 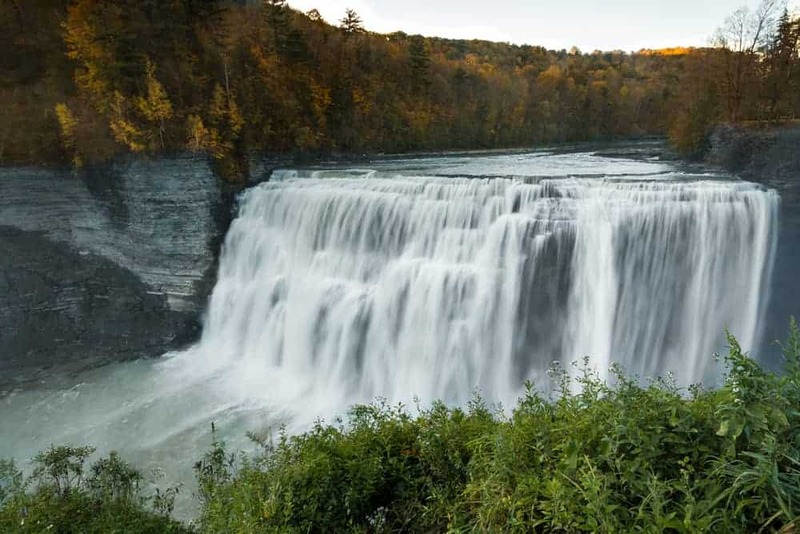 It is the Genesee River that flows through the majestic Letchworth State Park creating a massive canyon and featuring three major waterfalls. The Genesee River makes its way through a series of waterfalls and gorges in New York’s Letchworth State Park. 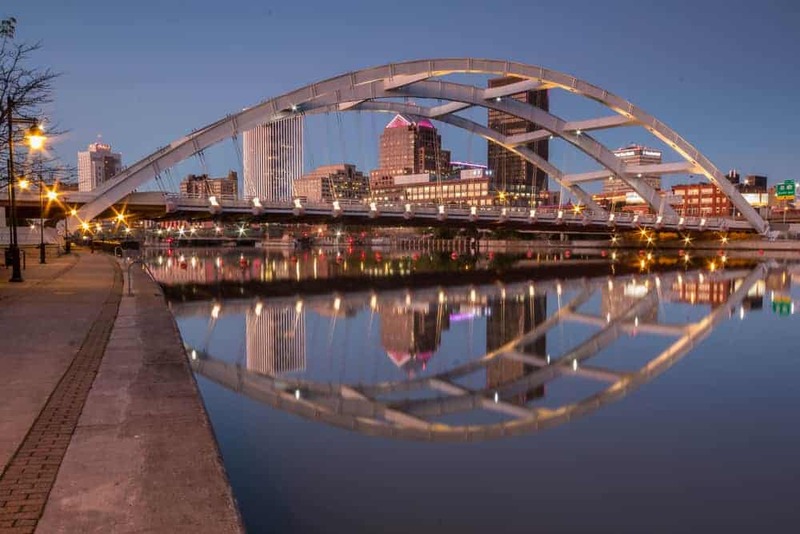 The river then continues to downtown Rochester where it travels through the city with two more major waterfalls and past the oldest brewery in New York. In fact, the city of Rochester was built up thanks to the mills along the banks of this river. Finally, the Genesee River empties into Lake Ontario and eventually to the Saint Lawrence River. 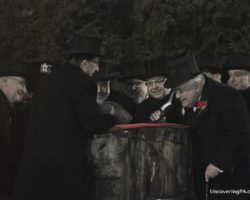 The closest-accessible site to the source of the Genesee River is located just off of Route 49 to the east of the Allegheny River. The Genesee River pass through downtown Rochester before flowing into Lake Ontario. The river flows under Kidney Road and is merely a trickle at this point. 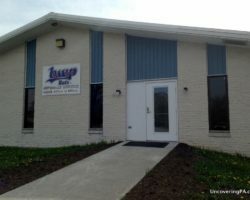 This spot can be found at the following coordinates: 41.859140, -77.861574. There is no sign at this point marking the river, but there is an informational sign along Route 449 that tells about the river, though the river can’t be seen at this spot. The source of Pine Creek near Gold, Pennsylvania. While Pine Creek might not be a river, it’s actually considered the largest creek in the United States. 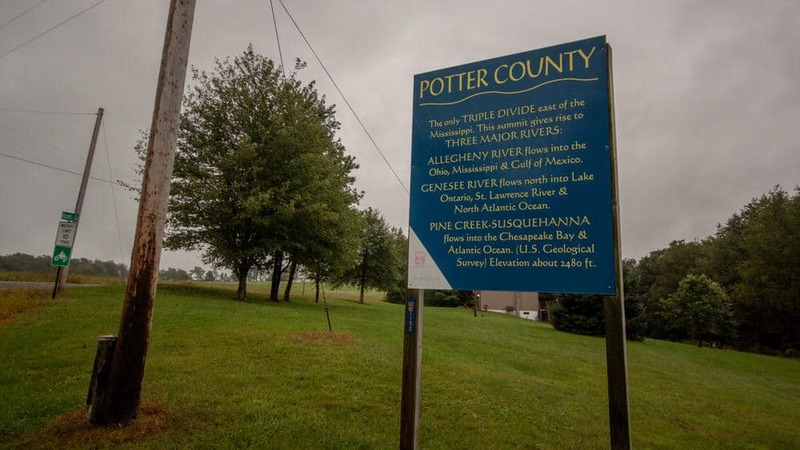 From this spot in Potter County, Pine Creek empties into the Susquehanna River, and eventually the Chesapeake Bay, but not before flowing through the incredibly scenic Pennsylvania Grand Canyon. 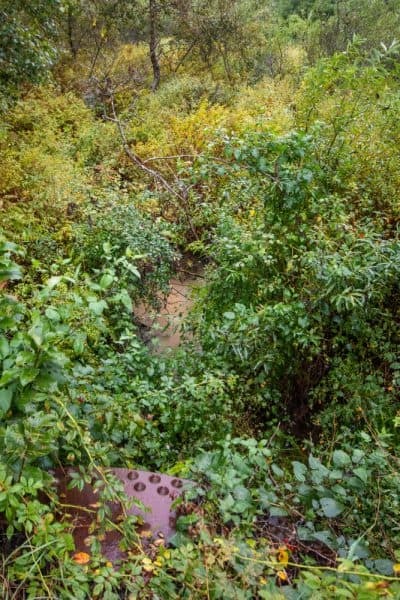 Pine Creek was important to the development of the region, being first used to transport logs to market along the waterway before train tracks would come to its shores. Pine Creek makes its way through the Pennsylvania Grand Canyon before meeting the West Branch of the Susquehanna River. The source of Pine Creek is located along Route 449 south of the Triple Continental Divide marker. Sadly, there is no marker denoting the waterway at this spot. The furthest upstream you can get to the source of Pine Creek can be found at the following coordinates: 41.855915, -77.814198. There is a small amount of room to pull over a car on the southbound side of the road. If you opt to stop here, use extreme caution as there is little room to pull over, the shoulder is quite narrow, and it is along a busy road. Want to see more of the region? 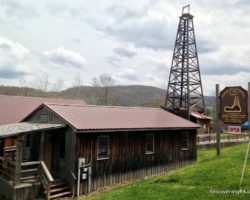 Check out the Coudersport Ice Mine, visit the Pennsylvania Lumber Museum, see the ruins of Austin Dam, or take a drive into downtown Wellsboro. I always heard it as the JEN-es-see River. But that aside, I always wanted to see the triple divide, but it is so far out of the way. Thanks for taking the time to track it down and shoot this footage. Very cool. Yeah, I pronounced it wrong in the video. Couldn’t go back and shoot by the time I realized it. 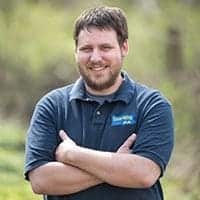 This is a really incredible post about a rather unique place I’d never heard of before! The pictures are excellent, and I loved that you included shots both at the source, and as the rivers grow massive along the way. Very cool post. Yes, I posted a correction twice within the video. I realized my mistake while editing, but couldn’t go back and reshoot. 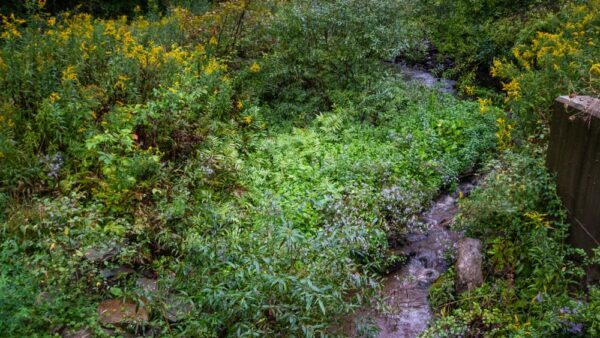 Thanks for such a well-done video that so crisply draws attention to a site of such symbolic value for illustrating the need to protect our rich national resources at their very starting point in the headwaters. The hill of the triple continental divide provides the planning document catchphrase (Triple Divide Trail System) for a two-state greenway (rail trails, nature parks, forested riparian buffers, protected green spaces) that will connect the breathtaking Pine Creek Trail (rail-trail) in PA\’s Pine Creek Gorge to the complementary canyon in NY\’s Letchworth State Park via trails along the Genesee River in NY (WAG Trail, Genesee Valley Greenway), PA state parks near the triple divide (Denton Hill SP, Lyman Run SP, et al. ), and Pine Creek. Eventually this will provide a spectacular bicycling and hiking mega-trail connecting Lake Ontario in Rochester, NY, to the Susquehanna River in Williamsport, PA. A long slow process that has been proceeding incrementally over the last few years, but perhaps will be completed in our lifetimes. I’ve stood on the US continental divide at the (very small!) pond near Yellowstone National Park. Also, in our own county here in NW Atlanta, our street divides the water flowing down to the Gulf of Mexico via the Chattahoochee River (going south) and the Allatoona River (going west, then south). Not as “mountainous” a divide though! We used to live right there where you are talking about. I believe now The triple Continental Divide Sign has been taken down to be refurbished and may be at the Potter County Historical Society awaiting an artist to volunteer to repainted it. I do know the private property owner that owns the property now. The one in the article was photographed in the early fall 2018 and looked like it was in great shape. I doubt that it’s been removed for repainting, but may have been put back up shortly before I visited.